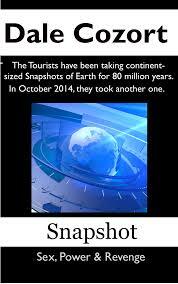 For eighty million years, the Tourists have been taking Snapshots of Earth, exact replicas of continents. Each Snapshot goes into its own snow-globe-shaped artificial universe. Snapshots are connected like a string of pearls by vents high over their oceans. Snapshot people and animals quickly diverge from the real world, creating a universe where humans and animals from much of Earth’s history explore, fight and sometimes meet themselves. In October 2014, the Tourists take a North America Snapshot, cutting everyone in that copy off from the real world, but letting them fly to Snapshots where dinosaurs roam, where Indians rule North America or where Soviets or Nazis rule Europe. They may also confront the menace that lurks on the other side of a wind-swept Antarctic Snapshot. This new Snapshot catches Middle East Analyst Greg Dunne rushing toward Hawaii to join his wife, his unborn sons and his extended family at a family reunion. The Snapshot doesn’t include Hawaii, so it cuts Greg off from everyone he loves. It also thrusts him into the aftermath of a hidden, decades-old massacre, part of a struggle between Germans from a pre-World War II European Snapshot and ranchers from Korean War-era US-53 Snapshot. The prize: a thinly settled North America-sized Madagascar Snapshot, much like the Wild West or the Australian outback. Whoever controls the Madagascar Snapshot controls communications between dozens of Snapshots. Greg struggles to survive in this cutthroat reality, to remain faithful to a family he may never see again and to find a way back to his original Earth. He is caught between powerful opponents. A rancher who rode a hidden massacre to almost unchallenged political power faces the only survivor of that massacre, a woman driven nearly insane by the experience, but now in her own position of power, plotting revenge. Snapshot is a fast-paced story of power and revenge set in a unique, marvelously rich universe. If this story interests you, please nominate Snapshot for Amazon’s Kindle Scout program. It’s a quick process: Click the link https://kindlescout.amazon.com/p/332ZJ8YN22MIT, click ‘nominate me’ and you’re done. If Dale’s book is selected, you get a free e-book copy. Sounds good to me! If the direct link doesn’t work for you, go to https://kindlescout.amazon.com/, then scroll down to the science fiction and fantasy section and scroll left or right until you find Snapshot. And oh, if you like science fiction, please check out my novel Light Bringer. Pat Bertram is the author of the suspense novels Light Bringer, More Deaths Than One, A Spark of Heavenly Fire,andDaughter Am I. Bertram is also the author of Grief: The Great Yearning, “an exquisite book, wrenching to read, and at the same time full of profound truths.” Connect with Pat on Google+. Like Pat on Facebook.